The first English casualties to be suffered in an air raid didn’t come from Messerschmitts or any of Hitler’s Vengeance weapons during World War II, but from German blimps, or zeppelins, in 1915. The first mission was to encompass bombings in the areas of the Thames estuary, the mouths of the Humber and Tyne, and the East Anglian ports of Harwich, Lowestoft and Yarmouth. Fregattenkapitan Peter Strasser, the leader of the mission, lifted off from the German coast aboard his zeppelin, the L6, at 9:30 that morning, but his participation in the raid was to be short-lived, as his zeppelin developed engine trouble off the Dutch coast and was forced to return to Germany. Despite the loss of their captain, the remaining 2 zeppelins, commanded by Kapitanleutnant Hans Fritz on L3, and L4, skippered by Kapitanleutnant Magnus von Platen-Hallermund, floated on to England. Problems began to arise for the remaining 2 zeppelins were blown off course and they made separate landfalls over the coast of Norfolk. 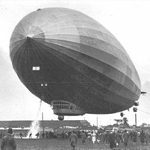 Without radio contact between the 2 zeppelins and with the weather being bad, neither knew where the other was. Locals, on the other hand, began reporting sightings of various aircraft to authorities. Finally, at 8:20 pm, L3 sighted Yarmouth and began its bombing run over the town, traveling from north to south. During the next 10 minutes L3 is thought to have dropped eight bombs, three of which failed to detonate, and two incendiary devices, causing an estimated damage and killing or wounding a handful of innocent bystanders. Because of the bewilderment of the locals on the ground, the zeppelins encountered almost no resistance, with reports of only one sentry firing on L3 as it flew overhead. As for the bombing raids, they achieved little in military terms. The damage was almost all done to private property, but psychologically the damage was huge. No longer were the British Isles immune to attack, with their powerful navy. Now the enemy could bypass that obstacle entirely by just flying over it. This attack, while small, was primarily a trial run for larger attacks that would come later on London, which began on May 31 of that same year. Several hundred people were killed in subsequent raids that eventually declined as the British developed incendiary ammunition which helped to bring down the zeppelins and once again regain control of English airspace. 1Almost all of the information for this piece came from an excellent write-up on Norfolk Roots 24. Other details came from The Worldwide School site. Share the post "England’s First Air Raid Casualties"